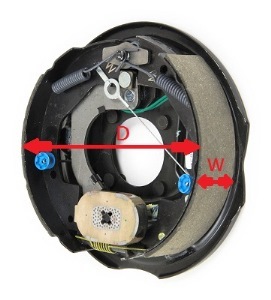 12" x 2" Right Hand electric complete brake assembly. 6,000lb-7,000lb capacity per pair. Mounts with 5 bolts (not included). Uses 12" Hub/Drums. Bolts-7-5 and washers-38LW sold separately. These components have passed the CSA Standard CAN3-D313-M85 For Trailer Running Gear, a stringent standard mandated by the Government to assure brake effectiveness and structural integrity of the components. • Fits standard 6,000lb-7,000lb axles with a 5 bolt pattern on the mounting flange.